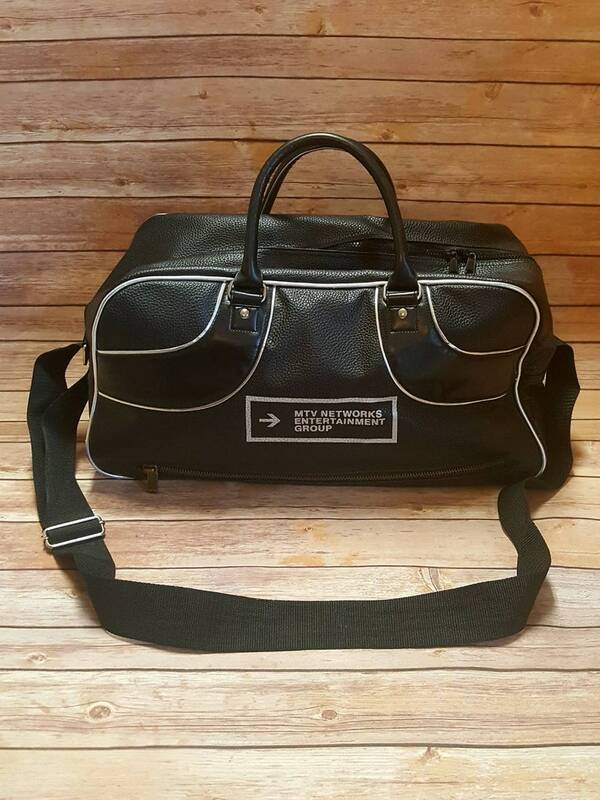 Super awesome vintage duffel bag from MTV Networks Entertainment Group. Faux black leather with contrasting silver vinyl piping. Nylon webbing adjustable shoulder strap and two padded black faux leather handles. Top double zipper is plastic. Bottom zipper is brass. It has silver tone stud 'feet' on the bottom. Very light scuffing on the bottom and wear to the bottom corners, but in good condition for its age. Large size, measures approximately 20 inches long, 9.5 inches wide, and 9.5 inches tall, not including handles.